Under Certificates and Private Key for HAProxy and Router, you must provide at least one Certificate and Private Key name and certificate key pair for HAProxy and Gorouter. The HAProxy and Gorouter are enabled to receive TLS communication by default. You can configure multiple certificates for HAProxy and Gorouter. 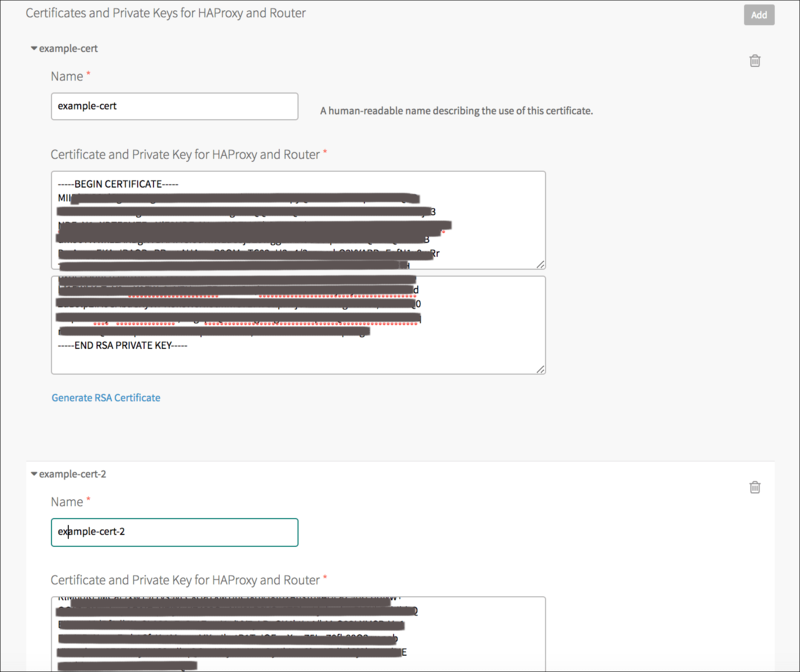 Click the Add button to add a name for the certificate chain and its private key pair. This certificate is the default used by Gorouter and HAProxy. 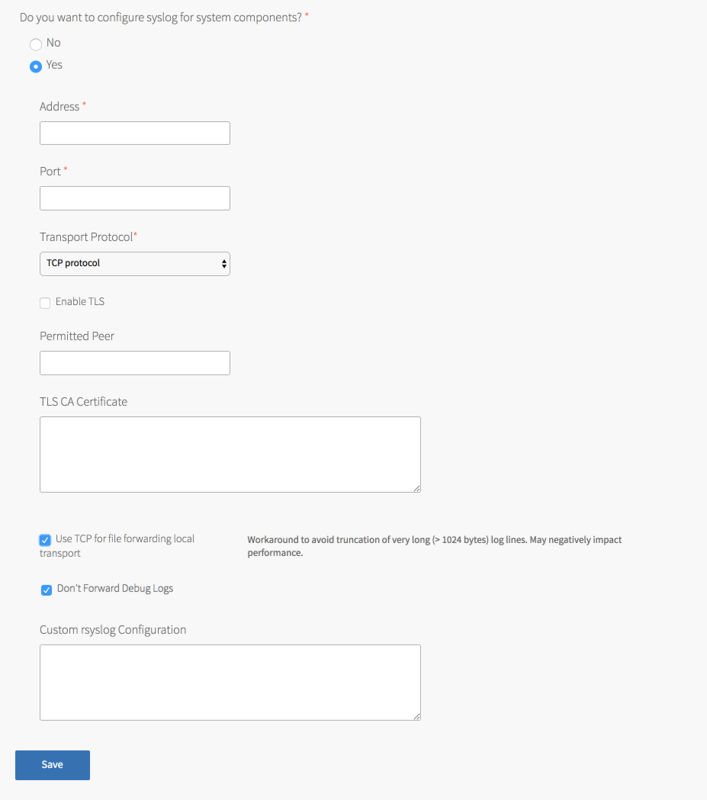 You can either provide a certificate signed by a Certificate Authority (CA) or click on the Generate RSA Certificate link to generate a certificate in Ops Manager. If you want to configure multiple certificates for HAProxy and Gorouter, click the Add button and fill in the appropriate fields for each additional certificate key pair. 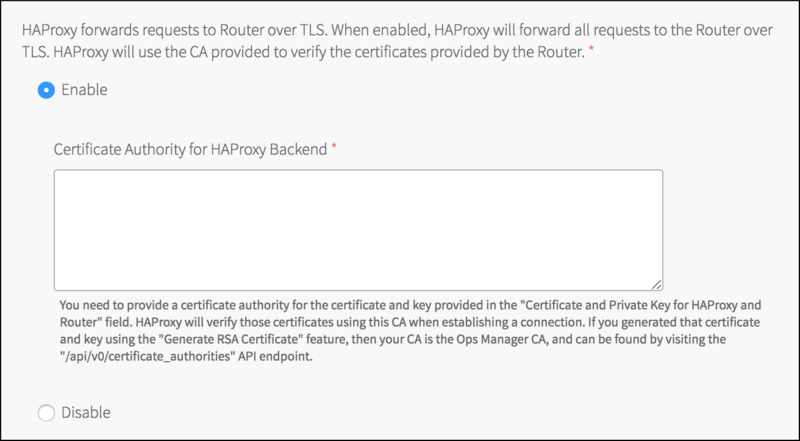 For details about generating certificates in Ops Manager for your wildcard system domains, see the Providing a Certificate for Your SSL/TLS Termination Point topic. 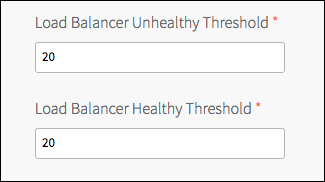 Under Configure support for the X-Forwarded-Client-Cert header, configure PCF handles x-forwarded-client-cert (XFCC) HTTP headers based on where TLS is terminated for the first time in your deployment. The following table indicates which option to choose based on your deployment layout. To configure HAProxy to handle client certificates, select one of the following options in the HAProxy behavior for Client Certificate Validation field. To configure Gorouter behavior for handling client certificates, select one of the following options in the Router behavior for Client Certificate Validation field. In the TLS Cipher Suites for Router field, review the TLS cipher suites for TLS handshakes between Gorouter and front-end clients such as load balancers or HAProxy. The default value for this field is ECDHE-RSA-AES128-GCM-SHA256:TLS_ECDHE_RSA_WITH_AES_256_GCM_SHA384. If you want to modify the default configuration, use an ordered, colon-delimited list of Golang-supported TLS cipher suites in the OpenSSL format. Operators should verify that the ciphers are supported by any clients or front-end components that will initiate TLS handshakes with Gorouter. For a list of TLS ciphers supported by Gorouter, see Securing Traffic into Cloud Foundry. Verify that every client participating in TLS handshakes with Gorouter has at least one cipher suite in common with Gorouter. Warning: The default cipher suites are required for communication with CAPI and removing them causes downtime. See Removal of Default Ciphers Causes Downtime when Upgrading from 2.2 to 2.3 and from 2.3 to 2.4. DHE-RSA-AES128-GCM-SHA256:DHE-RSA-AES256-GCM-SHA384:ECDHE-RSA-AES128-GCM-SHA256:ECDHE-RSA-AES256-GCM-SHA384 If you want to modify the default configuration, use an ordered, colon-delimited list of TLS cipher suites in the OpenSSL format. Operators should verify that the ciphers are supported by any clients or front-end components that will initiate TLS handshakes with HAProxy. Verify that every client participating in TLS handshakes with HAProxy has at least one cipher suite in common with HAProxy. Bypass security checks for route service lookup has potential security concerns, but may be needed for backwards compatibility. See the Route Service Internal Lookup Considerations section of Route Services for details. (Optional): Under Private Docker Insecure Registry Whitelist, enter one or more private Docker image registries that are secured with self-signed certificates. Use a comma-delimited list in the format IP:Port or Hostname:Port. Under Segment Name, enter the name of your isolation segment. This name must be unique across your PCF deployment. You use this name when performing the steps in the Create an Isolation Segment section of the Managing Isolation Segments topic to create the isolation segment in the Cloud Controller Database (CCDB). 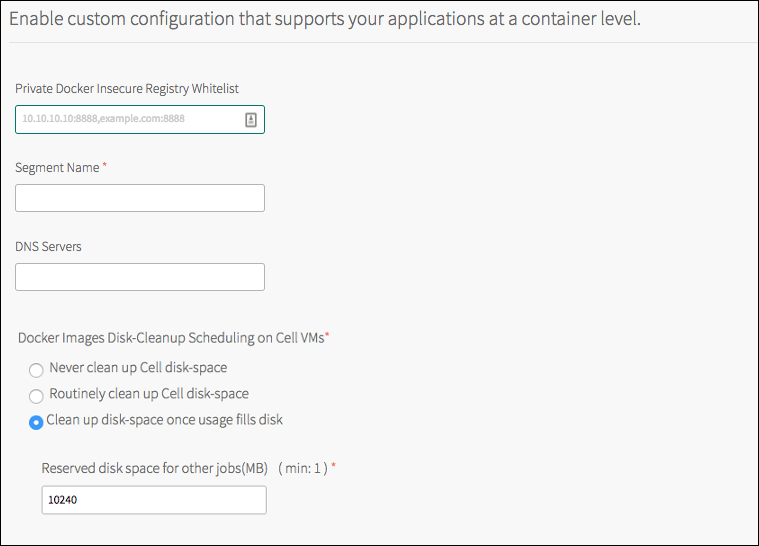 Select your preference for Docker Images Disk-Cleanup Scheduling on Cell VMs. If you choose Clean up disk-space once usage fills disk, enter a Reserved amount of disk space for other jobs in megabytes. 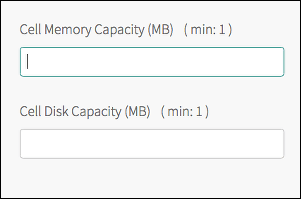 For more information about the configuration options and how to configure a reserved amount, see Configuring Docker Images Disk-Cleanup Scheduling. Under Enabling NFSv3 volume services, select Enable or Disable. 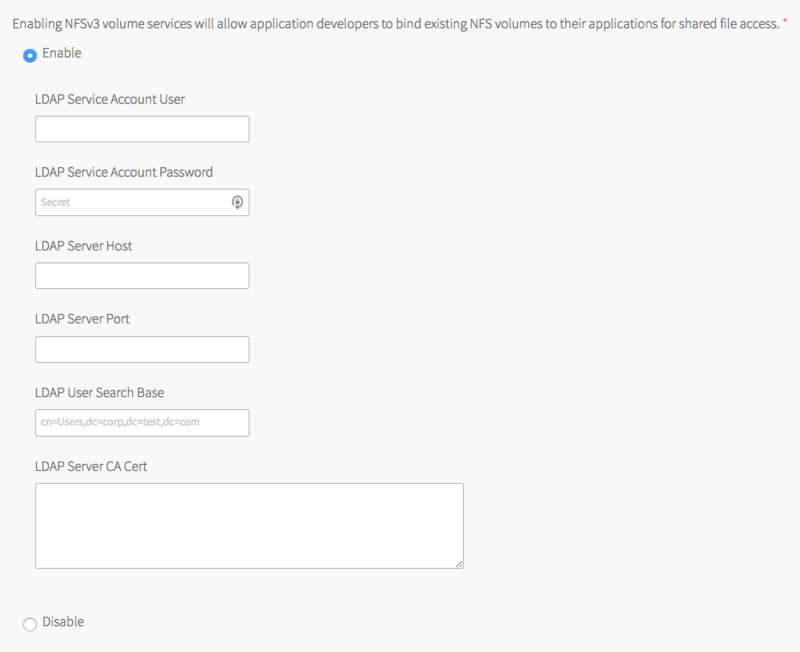 NFS volume services allow application developers to bind existing NFS volumes to their applications for shared file access. For more information, see the Enabling NFS Volume Services topic.